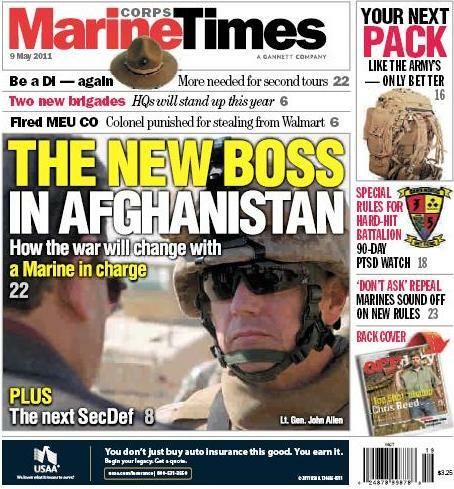 Last night’s breaking news about the death of Osama bin Laden occurred well after this week’s Marine Corps Times was put to bed. Still, this week’s issue offers plenty of new perspective on someone you’ll hear a lot about in coming months: Lt. Gen. John Allen, President Obama’s nominee to become the next commander of the International Security Assistance Force and all U.S. forces in Afghanistan. Obviously, Marine Corps Times was part of the chorus initially reporting Allen’s selection last week, when Obama made his announcement. However, this week’s cover story offers a wide variety of details about Allen that haven’t previously been reported. Leveraging interviews with on-the-record sources, background officials and senior military officials, fellow senior writer Gina Cavallaro and I paint a fuller picture of what Allen is like, and how he’s likely to lead as the commander of a war that is approaching 10 years old. We also share details about his relationship with other top U.S. commanders, including Army Gen. David Petraeus, the outgoing Afghanistan commander, and Gen. James Mattis, head of U.S. Central Command. To check it out, pick it up on newsstands this week or subscribe here now. My snappiest salute to LT GEN ALLEN! It’s indeed an honor and privilege working with you when you were in charge of the Philippines desk in Washington and I was then the Armed Forces of the Philippines LNO to the Joint United States Military Assistance Group (JUSMAG-Philippines). More Power and Semper Fi, Sir!